Here’s some photos taken during Dawn’s birthday. 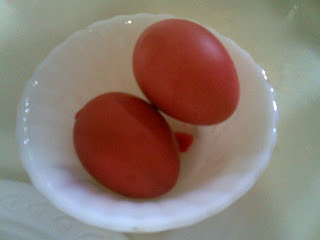 Poh Poh made these eggs for Dawn! Birthday Cake! Yee Yee ordered this for me! AIya! Forgot to take picture of the Sheperd Pie which Er Yee Yee made, and the lunch which Poh Poh prepared. And we totally forgot to take some family pictures…bleah! Pingback: Busy Mommy » Blog Archive » Dawn is 2!